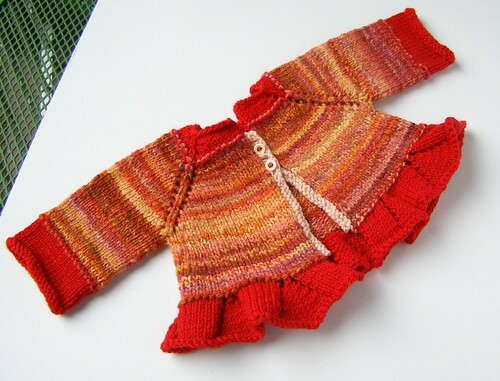 A very girlie bell-shaped top down raglan baby cardigan with a cute little ruffle at the bottom and contrasting neck and cuffs. No seaming required! Yarn: Worsted to aran weight yarns that knit to gauge. 135(145) yd [123(133) m] of main color and 65(85) yd [64(78) m] contrasting color. 10 yd [9 m] of scrap yarn for button band. If working the full length sleeve variation, you will need more yarn. Needles: 16 or 24 in. (40.6 or 61 cm) size 8 US (5 mm) needles and a set of double-pointed needles in the same size, or whatever size you need to get gauge. Size: smaller(larger), approximately 3 mo. (6 mo.) – Picture of 6 mo. with ¾ length sleeves. this pattern is also available with the belle, baby beau, and beau sweaters in the beautiful baby bundle ebook, and with other handspun designs in the mixed knits ebook. 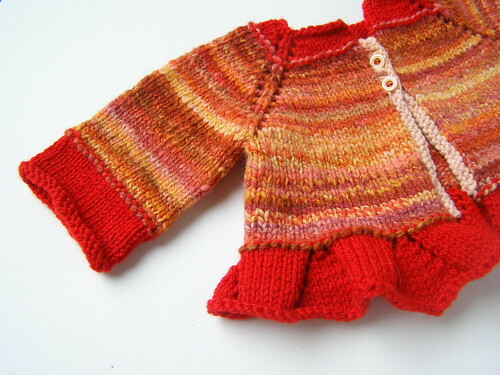 This entry was posted in baby, cosyknitsliterally, cosyspins, handspun, knitting, patterns, sweaters by cosymakes. Bookmark the permalink. That is super cute. I may have to get it just to knit one up for Lauren and maybe Paula if she has a girl. Knitty & spinning friends will love it. I really really love this. The ruffle reminds me of a baby bathing suit. So sweet! Wah! That button band is just the best. So sweet! I especially love the colours in the handspun. Great work! wow! That is completely adorable. I might have dreams about this sweater tonight. This is really funky, I love the combination of rectangular collar & the ruffle. Pingback: I finished something! And it’s not socks! « Super awesome vegan handknits.